This section of the blog article “Cause and effect in rhetoric” discusses how cause and effect concepts enter into Speech Act Theory, Rhetorical Theory, and Contemporary Rhetorical Theory. Speech Act Theory provides us with language to articulate the interaction between rhetorical intention and act, and between a rhetorical act and its effects. Rhetorical theory has provided claims that help to conceptualize rhetoric’s power to impact society. Contemporary thought about rhetorical theory seems to be acknowledging that the discipline has wandered from its roots. Recently, some scholars have urged the discipline to take up the courage to argue and conduct research in this vein. (Campbell, 1996, p. 690) From — Campbell, J. L. (1996). Speech Acts. In T. Enos (Ed. ), Encyclopedia of rhetoric and composition: Communication from ancient times to the information age (pp. 690-691). New York: Taylor & Francis. But how do we go from intended effects to study actual effects? This quotation below, helps one understand the difference between two types of cause-effect concepts in rhetoric: illocutionary speech acts (speech that has intended effects) and perlocutionary speech acts (speech that has effects, whether unintended or unintended). Yoos (2007, p. 145) From Yoos, G. E. (2007). Chapter 15: Rhetorical aims and modes: Appeals and responses. In Reframing rhetoric: A liberal politics without dogma (pp. 141-150). New York: Palgrave Macmillan. He explains that rhetoricians look at rhetorical cause & effect from two points of view: by studying intentions as well as results. While the former focuses on orators and their skills in crafting a text or performance, the latter looks at the rhetorical performances (“types of messages”) and their effects on the rhetorical situation. In the study of perlocutionary effects, effects are seen as any “influences and consequences … in a rhetorical situation.” One of these consequences — one specified by Yoos — is the effect that one can see in audience responses. We learn from this that when a rhetorician studies the effects of discourse, the most difficult connection to make is between the speaker’s intention and the situational or audience effect. The fact is, speakers/writers desire to have an effect but they can’t always get what they want! There are ancient and contemporary traditions and methods of rhetorical scholarship that are focused on the way in which rhetorical acts have causes and effects on their social contexts. While academic fashions since 1965 have frowned on bold claims of rhetoric’s effect on society, we can’t excise them from the past 25 centuries of rhetorical theory. The ancient roots of cause-and-effect arguments in rhetorical theory keep a number of contemporary rhetoricians interested in this line of argument, and as mentioned above, recent trends show that our collective interest is turning to these inquiries once again. Isocrates’ famous “Hymn to Logos” is of the earliest social constructivist claims about the power of communication to construct social institutions and laws and arts. because there has been implanted in us the power to persuade each other and to make clear to each other whatever we desire, not only have we escaped the life of wild beasts, but we have come together and founded cities and made laws and invented arts; and, generally speaking, there is no institution devised by man which the power of speech has not helped us to establish. sec. 254, from Isocrates. “Antidosis”. Perseus Digital Library 1980. Isocrates, Speeches and Letters. Ed. George Norlin. Tufts University. August 12 2006. <http://old.perseus.tufts.edu/cgi-bin/ptext?doc=Perseus%3Atext%3A1999.01.0144&layout=&loc=15.254>. The ancient Greek sophist Gorgias also made metaphorical persuasive claims that rhetoric had powers similar to those of drugs, physical force, and divine power, and he used these arguments to excuse Helen of Troy of bearing any responsibility for her abduction. For there is no subject, at least among those that must be treated impressively and with distinction, that does not belong to the orator. It is his task to unfold his opinion with dignity when giving advice on affairs of supreme importance. His task is to rouse the people when languishing and to restrain them when impetuous. By this same faculty of speech deceit is called to destruction and integrity to deliverance. Who can exhort people to virtue more passionately than the orator and who can call them back from vice more vigorously? Who can blame the wicked more harshly, and who can praise the good with more distinction? Who can quell passions more vehemently by censure? Who can soothe grief more gently by consolation? Cicero. (2001). Cicero: On the Ideal Orator (J. M. May & J. Wisse, Trans.). New York: Oxford University Press. Thus Cicero’s Antonius endows rhetoric with the power to amplify aspects of reality and truth, to call people to behave in accordance with the values they already hold, to bring emotional catharsis when events require that words call forth socially appropriate emotions. Finally, he even mentions the ability of rhetoric to inscribe history more indelibly on the minds of humanity. These are not merely proposed as rhetorical intentions and duties and aims. They express a theory that lays claim to the s potentially powerful and long-lasting effects of rhetoric on society. The Lady’s Rhetorick, from the eighteenth century, has one of my favorite expressions of the theory of rhetoric’s effects. This poetic praise of eloquence is found in an obscure, anonymous rhetorical textbook for women (and men too) published in 1707 in London. The theory empowers women to aspire to good social influence through rhetoric. Now to speak of the Excellency of Eloquence, I might say, that it exercises an Empire over the Hearts of Men; that it commands the Passions; that it triumphs over our Wills; and therefore by Quintilian is reckon’d as one of the most powerful and noblest Virtues. I might also compare it to the Sirens, that enchanted Men with their musical Singing; for it conveys into us either Love or Hatred, and other Affections, and prevails upon us and conquers us, notwithstanding our Resistance. Therefore the Pagan World represented the God of Eloquence without Hands, for it wants no Arms to overcome all Opposition; and their Opinion was, that the famous Men, who were call’d Hercules and Atlas, were but learned and skilful Orators, that triumphing over the Ignorance of the common People, and maintaining the Truth by their witty Harangues, got the Reputation of having thereby overcome Monsters and supported the Heavens with their Brows. ‘Tis most certain, that Eloquence hath always been needful to govern States and Empires; for by it Men have appeas’d the Seditious, persuaded the Unbelievers, and comforted the Afflicted: It serves to encourage the good Members, and to check the Evil and pernicious. In a word, this Divine Art is so wonderful and charming, that when a Greek Captain was ask’d, whether he were not more valiant than Pericles, answer’d in these remarkable words: Tho I have vanquish’d Pericles in a Fight, he is nevertheless so eloquent, that as often as he speaks of that Encounter, I own him to be my Victor. Besides, it hath this other Advantage, that thereby Persons are discover’d and made known, as well as by their Physiognomy. (Anonymous, The Lady’s Rhetorick, 1707, p. 5) from The lady’s rhetorick: containing rules for speaking and writing elegantly. In a Familiar Discourse directed to an Honourable and Learned Lady. Enrich’d with many delightful Remarks, witty Repartees, and pleasant Stories, both Antient and Modern. Done from the French, with some improvements. (1707). London: Printed for J. Taylor and A. Bell. Of course, the above is a poetic praise of eloquence meant to sell a book and motivate rhetorical study, but it is in fact also a type of theory about rhetorical causes of social effects, in the same vein of Isocrates and Gorgias. It has played a role in theorizing the nature of rhetoric as a cause of social effects. Contemporary Rhetorical Theory, after centuries of immersion in the instrumentality of rhetoric, has recently gone through a temporary pendulum-swing away from the analysis of cause and effect. But recently (as hinted in the introduction to this piece) contemporary theorists are recommending a return to the study of rhetoric’s effects on society. 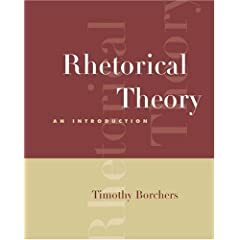 Traditional rhetorical theory views rhetoric as intentional, persuasive, linguistic, addressed to an audience, and applied to a specific situation. …. [but] contemporary rhetorical theory has not focused primarily on a theory of discourse construction like that of the ancients. Instead, the project has shifted to analysis and criticism of rhetorical artifacts, and of the place and role of language in society. …. How do we hold on to the tradition of rhetorical theory while allowing room for these new approaches? …. Phillips explains that perhaps the way forward is synthesis: to combine ancient and contemporary approaches. Yet he believes that our discipline gains its theory of the power of rhetoric from its ancient tradition. The ancient tradition provides “a practical element that allows rhetors to exploit the power of rhetoric” (p. 340). From Hauser, G., Eberly, R., Cargill, M. A., Doxtader, E., Greene, C. P., Marouf Hasian, J., et al. (2003). What Does Rhetorical Theory Do? And is That a Stupid Question? A Research Symposium. 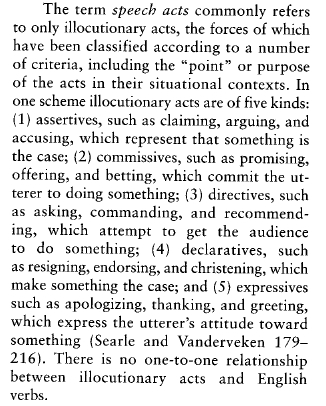 The Review of Communication, 3(3), 311-347. This entry was posted in Rhetoric, Rhetorical Studies and tagged Rhetoric, rhetorical theory by Dr. Smith. Bookmark the permalink.